Based in the San Francisco Bay Area, our team has over 25 years of lead generation experience and a commitment to quality service that is unparalleled in the industry. and he was well prepared for my visit. The qualification team really did its job! "This month we've set 15 appointments out of 18 leads... that's over 80%. And the average investable amount has been $475,000!" for around $2,000. These numbers speak for themselves." We can't promise that every advisor will have the same success with our leads. Leads are a "numbers game", and we all know it. What we can promise however is that we will do everything in our power to deliver only the most qualified leads that we think have a reasonable chance of turning into business for you. We've got the best leads in the industry and we leave nothing to chance. We use the best sources to target the right prospects, and our qualification process weeds out the rest. Our leads come from high quality, branded websites that we control. These sites attract consumers who know what they want, and are looking for help. 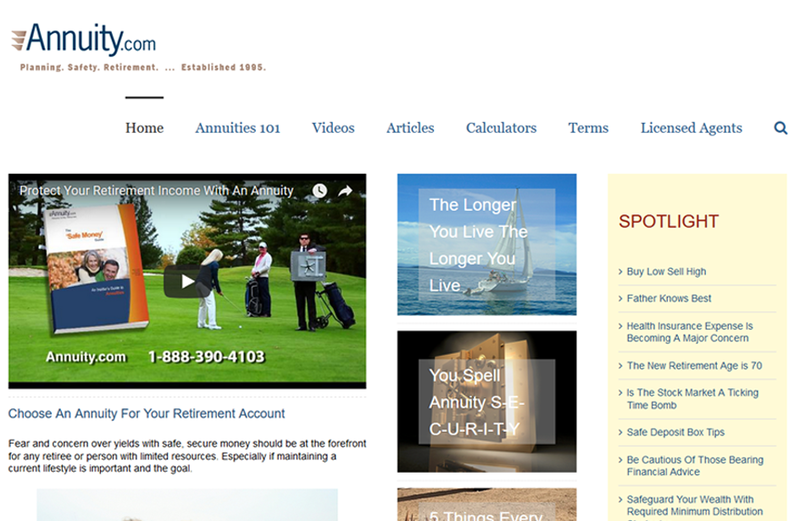 What better way to attract consumers interested in annuities than to have the best domain in the industry? Every consumer that comes to our site and fills out a form knows exactly what they want... an annuity! 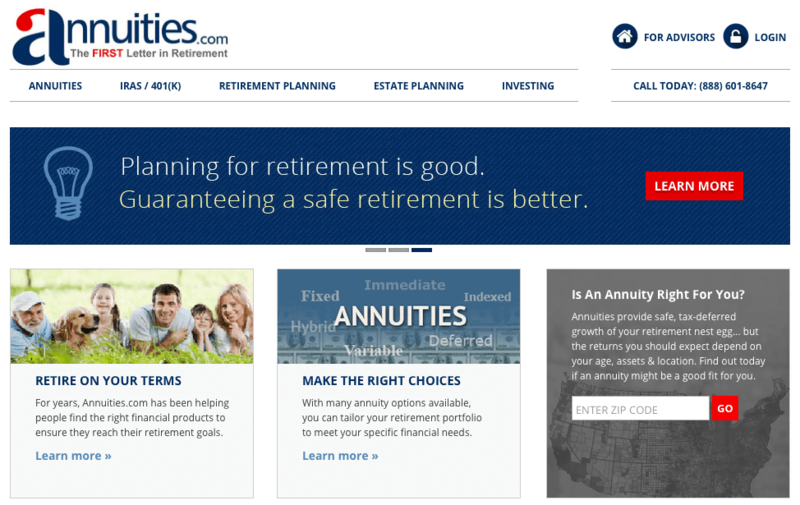 Yes, we own Annuities.net as well! We use this site to attract “organic” visitors (i.e. the consumer comes to our site after typing in keywords like “invest in annuities” or “annuity rates” on Google or Bing).. Yes, we control this domain too! What better way to attract consumers interested in annuities than to have the best domain in the industry? Every consumer that comes to our site and fills out a form knows exactly what they want... an annuity! Investments.news focuses on finding consumers interested in discussing their retirement planning with a licensed professional. We then try to phone qualify each lead to gauge their interest in safe money products such as annuities. Our carefully crafted advertisements find consumers who are interested in receiving help from an advisor, and who have money-in-motion. 80% of our leads are Annuity-focused, while 20% are general financial leads (Life, LTC, 401(k)s, Planning, etc.). You choose what you want! Our in-house call center qualifies every lead we sell. This process weeds out the bad leads, and qualifies the good leads' assets and interests. Our goal is to set you up for a productive face-to-face meeting. We even give you the notes we take during our phone call! Financialize to give you several options, as well as complete control over the process. sources like Google to find prospects ready to meet with you. to preview leads before ever making a bid. Sign-up for the Program (takes about 3 minutes!). Choose your Territory (the larger the territory, the better the lead flow). Set your Monthly Budget (we work with you to help you succeed, whatever your budget!). Receive real-time notification when each exclusive lead has been assigned to you. Get the notes from our call with the prospect and you should be well on your way to closingthe sale! Just as the name would suggest, FinAuction is an Auction / Bid Lead Program where you receive free lead alerts, and bid on leads that interest you. You are only billed when you win an auction. PRICE:Depends on your bid. Prices range from $10 to $199 per lead. You give us your territory, and we'll send you email alerts for leads to bid on. If you've ever used eBay, you'll know this is super easy! You control everything! If you WIN the auction we'll send you the complete lead details (all leads are 100% exclusive! ).If you lose the auction, don't worry, we'll send you lead alerts for new leads as soon as they become available in your area. The first thing you do when you set up your profile is to tell us what territory you want to cover (Ex: Texas, or 250 miles around zip code 75001). Our system will automatically send you lead alerts by email for leads that match your territory. You will be able to see details about every lead BEFORE you even make a bid. This includes details like the lead's age, retirement savings amount, City & State, and when available, the notes from our phone call with the prospect. When you see a lead you like, you simply make a bid for it. If you've done eBay before you'll be a pro. If not, don't worry - it's super easy... You put in a bid for the lead, or a maximum bid if you want the system to bid for you automatically, and just sit back and wait. If there's a lead you absolutely want, we have a "buy-it-now" feature that makes you winner on the spot! The Winner gets the Details! All of our leads are 100% exclusive. If you win the auction, we'll immediately send you the contact information of the lead (name, phone number and email) so that you can then contact the lead directly. Get the notes from our call with the prospect and you should be well on your way to closing the sale! * Upgrade opportunities to lock in Priority Positioning and have your monthly budget fulfilled first. Limited availability, based on territory. As the name suggests, Auction leads are purchased through on online auction/bidding process. Receive alerts when an Auction lead becomes available in your territory. Only bid on or buy leads that interest you. Lead auctions last 24 business hours. You are only billed when you win an auction. See the lead's details to see if it's a "fit" for you (age, assets, interests, etc.). If you WIN the auction we'll send you the complete lead details (all leads are 100% exclusive!). If you lose the auction, don't worry, we'll send you lead alerts for new leads as soon as they become available in your area. Consumers rate us highest, and the trust they have in us makes your job easier! Here is a sample of what our phone qualifiers deliver. Charles has $325,000 saved for his retirement. Over $200,000 of this money is in his IRA, While the rest is in a combination of mutual funds and stocks. His greatest concern is outliving his retirement savings, so he is interested in a product that will guarantee monthly income when he is older. He and his wife would like to retire in 5 years and want to be sure they are making smart choices with their money. Charles says the advisor can call anytime but prefers late afternoons if possible. the following are questions that you might be thinking about. On average, advisors set 50% to 70% of our leads to appointment. least 10% of your leads to sale, something is wrong. Should I use the Elite Program or the Auction Program? You should sign up for both. The Elite Program will deliver you our best, cherry-picked leads, while the Auction Program helps you cast a wider net and pick & choose from the remaining leads at your convenience. How many leads are available in my territory? This depends on which program(s) you choose (the Elite Program gets the most), how large your territory is, and what your monthly budget is for leads. Our system is able to increase and decrease lead flow in specific areas on demand, so unless you cover a very small, rural area we should be able to get you leads. Are there any pre-payments or minimum requirements? No. There are no set-up fees, no monthly minimums and no pre-payments. You are free to come and go as you like. So, hopefully we've convinced you! You want to buy leads. We want to sell leads. So far, so good! Set-up your account in 3-minutes using our self-service wizard, and you'll be on your way to getting your first client via Financialize! © 2019 Financialize.com. All Rights Reserved. 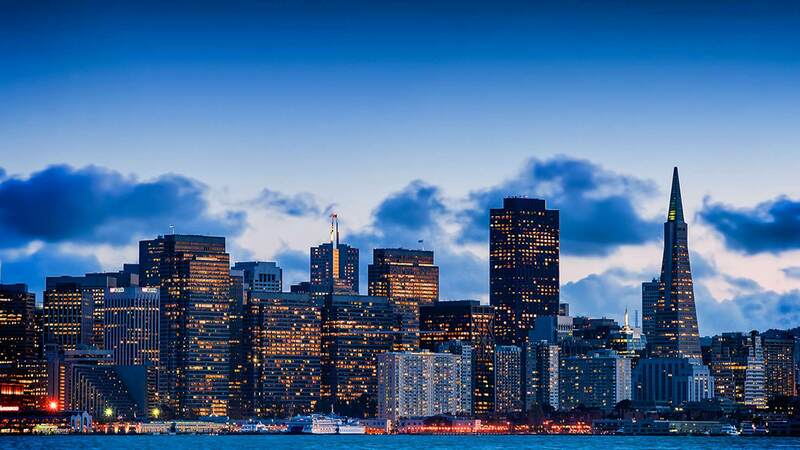 San Francisco Skyline photo compliments of Cliff Baise and licensed by Creative Commons. 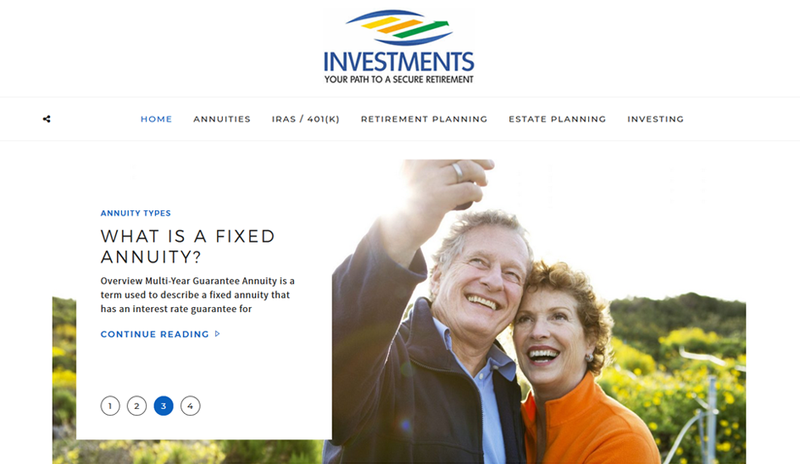 For years, Info-investments.com has provided objective, unbiased annuity information to consumers interested in making the right choices with their retirement savings. We do NOT sell annuities or any other financial products or services, and we are NOT affiliated with any other company. 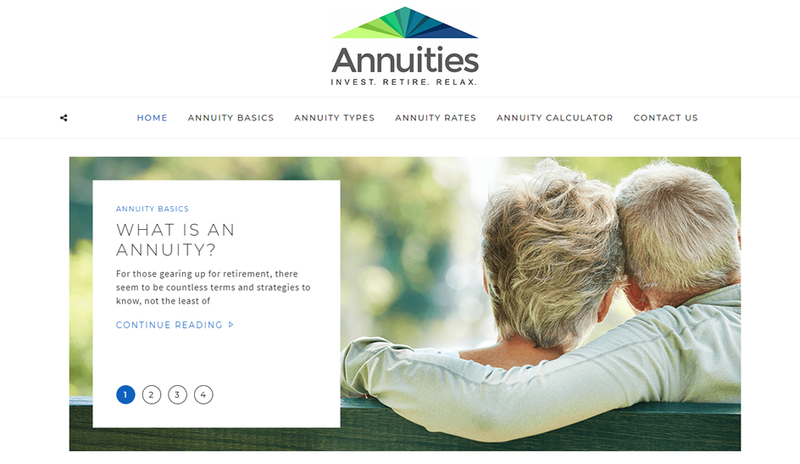 Our job is to answer questions on as wide a range of annuity topics as possible, and provide free annuity quotes to consumers who feel an annuity might be the right fit for them. Financialize.com is a marketing technology company designed specifically to help Financial Professionals source and purchase leads. We provide the traditional method of lead purchase as well as an auction platform that allows advisors and agents to create territories from which they would want to receive lead alerts, and an auction process that allows them to place bids on those leads they wish to target. We have a combined 25+ years experience in generating high-quality financial leads, and we work with some of the biggest brands both online & offline. One of our core value propositions is that we control the lead process from A to Z, including owning and operating our own call center. As a result, we leave nothing to chance and can ensure that all aspects of lead quality can be closely monitored. Financialize.com a privately held Limited Liability Company registered in Delaware. For more information, please contact us. www.Financialize.com. does not offer individual investment advice. This site is published with the understanding that the publisher is not engaged in rendering legal, tax, or investment services. Since each individual’s situation is unique, a qualified professional should be consulted before making financial decisions. The information is provided on an “as is” basis. We make no guarantees as to the accuracy, thoroughness or quality of the information, and are not responsible for errors or omissions. The information provided at this site is neither comprehensive nor appropriate for every individual. Some of the information is relevant only in Canada or the U.S., and may differ elsewhere. Some of the site content and linked sites relate to subjects or investment strategies that might not be appropriate for some individuals. 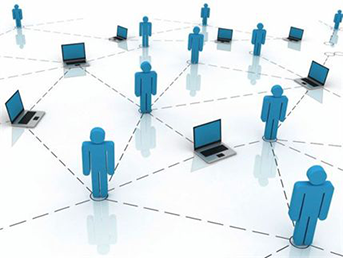 You are strongly cautioned to verify any information before using it for any personal, financial or business purpose. This site is provided on the express condition, to which all making use thereof assent, that no liability shall be incurred by www.Financialize.com., www.Financialize.com., Inc. or any of its employees. You also understand that www.Financialize.com. cannot and does not guarantee or warrant that files available for downloading through the site will be free of infection or viruses or other code that manifest contaminating or destructive properties. You are responsible for implementing sufficient procedures and checkpoints to satisfy your particular requirements for accuracy of data input and output, and for maintaining a means external to the site for the reconstruction of any lost data. In no event will www.Financialize.com. be liable for (i) any incidental, consequential, or indirect damages including, but not limited to, damages for loss of profits, business interruption, loss of programs or information, etc. arising out of the use of or inability to use the service, or any information or transactions provided on the service, or downloaded from the service, or any delay of such information or service. Even if www.Financialize.com. or its authorized representatives have been advised of the possibility of such damages, or (ii) any claim attributable to errors, omissions, or other inaccuracies in the service and/or materials or information downloaded through the service. Because some countries do not allow the exclusion or limitation of liability for consequential or incidental damages, the above limitation may not apply to you. In such countries, www.Financialize.com.’s liability is limited to the greatest extent permitted by law. This agreement shall all be governed and construed in accordance with the laws of Delaware in the United States of America. By using our website, you consent to the agreement as specified above. Our participating financial professionals, to whom this information is referred, are bound by the same terms of confidentiality, and use such information to contact the customers for purposes of providing customers with the requested information. Aggregate statistics about our customers, sales, traffic patterns and related site information may be provided to reputable third parties, which will not contain personally identifying or financial information. Financialize.com may release account information when we believe, in good faith, that such release is reasonably necessary to comply with the law, enforce the terms of any of our user agreements or protect the rights, property or safety of Financialize.com, our customers or others. By submitting your information via our website, you acknowledge and agree that we may contact you to discuss our lead generation and auction programs. Contact us about any questions you may have about our site, or products, and our company. Our toll free number is (888) 390-4132, or you can email us at: info@Info-investments.com .